A lot of things can go wrong with your garage door, which means there is almost always a potential for accidents. Springs can break, which will be a scenario that's extremely dangerous on its own, but as a result of that, your door panels could also collapse, which will be even more dangerous to any nearby person or object. The best way to prevent accidents of this type is by making sure your system undergoes routine maintenance. Yes, maintenance that's performed on a regular basis will help you avoid a lot of potential issues. However, there's an added benefit that goes along with that. By making sure any component that's starting to wear out gets replaced before it breaks or malfunctions, no collateral damage will take place, and therefore many other parts of your system will not suffer from unnecessary damage. This will help them maintain an optimal performance, and your garage door system will actually last for much longer because of that. While some minor routines, such as spring lubrication and inspection can be performed by you directly, they are best left to trained professionals. 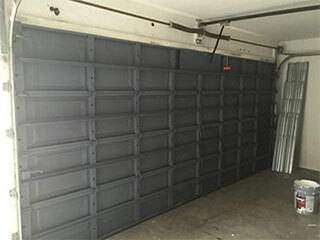 Technicians who specialize in garage doors can perform these tasks at a level an amateur simply will never reach. They'll be able to detect issues you could potentially miss. As far as any actual repair or replacement goes, we urge you to never attempt to perform any of these procedures by yourself. The dangers involved are simply too great to be worth it. It's true that your system's performance will benefit greatly from routine maintenance, but its safety and security will also gain a lot. By making sure that professional technicians test out the various relevant features of your system, any breaches will be detected and addressed right away, preventing them from being exploited. Your safety sensors, for example, need to be able to detect obstacles that get in your door's path in order to reverse the system and prevent the door from hitting any object or person. Since these are delicate components, they require expert hands to be realigned correctly, not to mention be replaced and installed. Our experts at Garage Door Repair Snellville are known for the meticulous maintenance routine we provide local homeowners with. If you'd like your garage door system to last for as long as it can while remaining safe to use, then call our professional team to schedule an appointment today.